The close relationship between Hillary Clinton and billionaire globalist George Soros came into clear focus when WikiLeaks released emails from Clinton campaign chair John Podesta. Clinton rarely mentions Soros’s name publicly, but the emails released thus far show the billionaire’s deep influence on the Democratic nominee. His name comes up nearly 60 times in the email exchanges. 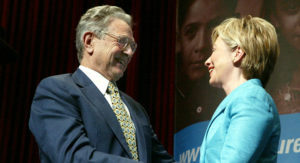 Soros has donated nearly $11 million to Clinton’s Democratic presidential campaign and three main super PACS — USA Action, American Bridge 21st Century and Hillary for America, according to an analysis by Rowan Scarborough for The Washington Times. Rep. Duncan Hunter, California Republican and co-chair of Donald Trump’s congressional leadership caucus, said a vote for Clinton is a vote for the Soros agenda. “The fact that Hillary Clinton and her campaign are so closely aligned with George Soros and his radical agenda is serious cause for alarm,” Hunter told The Washington Times. His foundation has given up to $6 million to the Clinton Foundation. “A review of Mrs. Clinton’s private and public comments shows she has very much absorbed Mr. Soros‘ grand plan for the world, a blueprint that hangs under the title ‘open societies.’ His New York-based Open Societies Foundation is at the center of his philanthropy and politics,” Scarborough wrote. “My dream is a hemispheric common market, with open trade and open borders,” Clinton told a closed-door audience at Brazilian bank Banco Tau in May 2013. Clinton said on CBS’ “Face the Nation” that she wants to boost President Barack Obama’s mark of 10,000 Syrian refugees resettled in the U.S. in one year to 65,000 — a 500 percent increase.